Veteran "pest control manager" Darin Rodriguez says he's not in the same league as a policeman or a fireman, but he does see himself as serving society by helping eliminate possible sources of disease such as insects and rodents. Above, Rodriguez on Friday pulled on his gloves before heading out to inspect some rodent traps in the airport industrial area. Darin Rodriguez knows how to get rid of pests; he does it every day for business customers throughout the Honolulu airport industrial area. In some ways, he feels like he's a man on a mission, to help people by removing possible sources of disease. He personally services more than 150 customers a month, and tries to manage his time efficiently so he can recruit more customers for his employer, Terminix Commercial Hawaii, which has an incentive package built into its employee salary structure. Rodriguez became a Terminix employee in 1998 through the company's acquisition of his previous employer, Dynamic Termite & Pest Control. Rodriguez, 42, is a graduate of Kaimuki High School and is married to the former Judy Matos, with whom he has a 4-year-old daughter and lives in Ewa. Rodriguez says they moved there "when the market was just right." Some people complain about the drive to work from Ewa, he said, "but I just turn on a good talk show radio and don't worry about it." Question: What do you do for Terminix Commercial Hawaii? Answer: I take care of commercial buildings, warehouses, stores, for our branch. Also, I'm actually the only tech that has all my badges to go into the airport; I take care of the airline lounges and some of the stores inside. We do a lot of those. And even security areas. Q: How long have you been a pest exterminator? Q: Have you always worked for Terminix? A: Well, I worked for Dynamic Pest Control, which was bought by Terminix, and I guess you could say I was part of the acquisition. But in my mind, I didn't quit, I didn't start with a new company. I just carried over. Actually, the owner of Dynamic Pest Control, Carlton Agena, is a well-known figure in the community. A: He sold the business to Terminix. He stayed on with Terminix as a quality-assurance guy. He makes sure everybody does a good job. Q: What were you doing before you became a pest control guy? A: I was in construction. I was doing vinyl siding for a small company, and they took an extended trip to the mainland, and they told me to apply for unemployment and a part-time job until they got back. So I went to work for Dynamic for what I thought would be a very short job, but when (the siding company owners) came back, they laid me off, so, lo and behold, here I am. I just stayed. Q: How do you define "pest"? A: I guess it would be something you don't want in your area, and you would like somebody to do something about it. I can't take care of some person you might not like. (Laughter) Whatever product I carry, and whatever pest is labeled on there, I can treat it for you. Or I make recommendations. 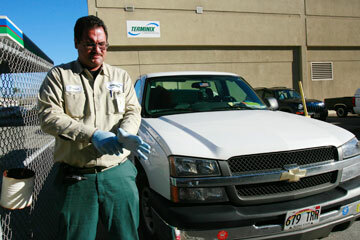 Darin Rodriguez says rodents are probably the biggest pest problem at commercial accounts. 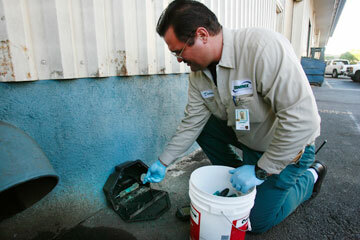 Above, he services and cleans a rodent-bait dispenser. Q: What kinds of pests do you find most often? A: The majority of my commercial jobs are probably rodents, because I do a lot of the industrial areas. Then probably the second -- or maybe the first for the night techs -- would be the German roach. A: The German roaches are the little roaches you find in your kitchen. Q: The fast, sleek ones. A: Yeah. And then the American roaches are the big ones you see outside. Some people call them B-52s. Q: Are you involved in the termite side of the business? A: Our branch, we don't do fumigations or ground treatments because we're the commercial side, but we'll do spot treatments for drywood, like for a door jam. So we would actually drill a few holes, treat the suspected area, patch the holes up, and that's a spot. Q: What do you do about mice and rats? A: The two key things for, I guess, any of your readers to do before they even call us would be to look at sanitation, and then exclusion. A: If you have holes, make sure you seal them. A rat can generally fit through a hole the size of a quarter. So if your door has a gap under it, a rat can get through that. So exclusion would be to keep them out. And sanitation would be to make sure there is not conducive conditions, where you're feeding them. So those two key things could keep someone from calling us. But once we come, we have several trapping methods. For the outside, we use a rodenticide -- it would be a bait. They feed on it and that's it. Q: Are you supposed to dispose of the dead rodents? A: Yes, we remove them, and we have our methods of disposing of them on our site. Q: Like what -- you flush them down the toilet or what? A: (Laughter) Well, whenever we dispose of anything, there's a method that the Department of Agriculture picks. So for rodents, you have to wrap it in newspaper or plastic, so there's not a bad odor, and we dispose of it in our trash receptacle, which is taken away buy our disposal company. A: We do bird exclusion. We can put up nets, which would keep the birds from roosting on beams. And then there are bird spikes, which doesn't hurt the birds but makes it uncomfortable. They can get used to it, but it's a deterrent. The other way, which Waikiki is having a lot of, is trapping, removal and disposal of birds. But we can only do that with a permit. Q: Anything else you've ever been asked to get rid of? A: A lot of people ask us to get rid of lizards -- geckos -- but they're generally our friends. Most people complain that their droppings are a nuisance in their homes, but we generally don't take care of geckos. We recommend exclusions -- that your screens are fitting tightly, and that you have a screen door. Q: Do you think centipedes are anything people should worry about? A: We consider them an occasional invader, especially in the office area. They're just wandering around and they happen to come inside. If you have regular treatment, he'll come across a (poison) product and he probably will be dying if you see him. Q: What kind of equipment do you take with you on the road? A: We have a B&G sprayer -- B&G is a brand -- it's a compressed-air container that sprays. I've had one for 10 years. They're very sturdy. 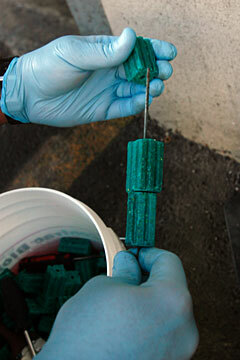 I personally use a cordless drill for anchoring bait stations, drilling holes for drywood termite treatment. For termite inspections, I use a screwdriver or ice pick, for like poking the corners, to see if you have soft areas with termites. We also have flushing agents to see if bugs come out. Q: What kind of chemicals do you use? A: We use liquids that we mix with water; we use aerosols that are ready to use; gel baits; solid baits, which would be for the rodents, like a little cube that you put in your bait station. We use dust-type (chemicals), for putting in wall voids. A: Let's say your kitchen is totally infested with roaches and we haven't been able to solve the problems. There may be a colony in your wall void, so we'll drill some holes and insert the dust to get at them. Q: That's like for double-wall construction? A: Yeah. But there are also wall voids elsewhere, like in the plumbing area, which is in a void of it's own. So any home or business would have areas where you could use a dust product. Q: On average, about how many customers do you visit each day? A: I personally have 165 a month, so I guess you could break it down. I try to manage my route and do as many as I can in the beginning of the month, so if I have free time at the end of the month, I'm available to do starts. I work on partial commission basis, so picking up a start would allow me to pick up some extra money. So it behooves me to manage my route well. Q: Do you cover a certain area? A: My area is the airport area. It's very condensed over here, so there is a lot of business. But as one of the senior techs in our office, I am asked to go to other areas and help out. Q: Do you ever have to crawl around in attics or tight spaces? A: Occasionally we're called in to check out crawl spaces or attics. If you have birds in your attic or something, we may do exclusion for you by sealing the holes and nest removal. If you have a crawl station under your building, we may determine that we need rodent traps down there, which would mean me crawling down there once a month and inspecting them. Q: What are some of your biggest challenges on the job? A: I would say my biggest challenge is to convince customers that continuous service is a good thing. Restaurants pretty much have to have it, for inspections and such, but offices are different. I can get rid of the rats, but eventually they'll probably come back in. So the occasional catch is probably the better thing than having to do a cleanout. Q: Do ever feel sorry for any of the critters you have to take care of? A: Well, I'm a Christian at heart. But if a rodent can carry disease that can make you sick, or my clients sick, there's a benefit to what I do. I can't class myself with a fireman or a policeman, but I help people in the long run. Let's say your home is roach infested, and you have small children. They can get asthma. So I'm actually doing a really good service, in a way. Q: What do you like most about the job? A: I'm not stuck in an office all the time. I get to go around to different businesses and meet different people. It's not monotonous. I get to work on the inside, I get to work on the outside. My office window is my truck's window, and I get a different view all day long. I don't see myself changing jobs before I retire. And this company, it's a pretty good company to work for. They take care of me. I guess the bottom line would be, I can support my family. I don't have a limo or anything, but especially in Hawaii, where so many people have two jobs, I have one job. On average, we're doing well. "Hawaii at Work" features people telling us what they do for a living. Send suggestions to mcoleman@starbulletin.com.